Before getting started we must check our current website speed This will allow us to measure the difference before and after. Here are some useful tools from which we will be able to know how long it takes to load our website. Google's Page Speed Publisher Tool:This is a free publishers tool by Google.You can use online Page Speed tool or you can download Google chrome extension to measure your website's speed. GIF is ideal for images with few colors like logos. JPEG is great for images with lots of colors and details like photographs. PNG is the choice when you need high quality transparent images. Avoid using larger scale images,don't use images with large pixels use HTML attributes to manager height and the width of your image to increase website load time.If you require 100x100 pixel image and instead of it you use 600x600 pixel image then you are simply making it difficult for yourself.You must use software like Photoshop or you can directly manager width and height of your image by HTML. Every time a 301 is used it force web browser to reload the page from very beginning which reduce your site speed.So if its possible reduce 301 redirects. Compress your content is the key to increase site speed it can create great impact on reducing site load time.For more information HTTP Compression on WikiPedia.com. Those are some good tips indeed! I made some changes to my own website recently and the speed more than doubled for me! 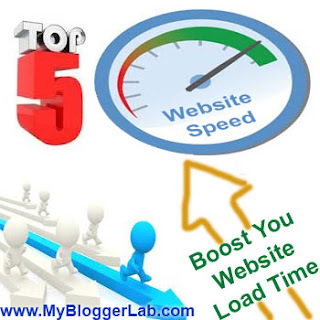 Yes I Do Agree with you as WordPress it self has many plugins which helps a lot in speeding up your blog.but under 5 minutes is too much about few seconds in consider a good speed.